As Google Chrome continues to grow, so to the extensions that go along with it and their functionality. Below are a few extensions that bloggers can use to quickly create new blog posts without leaving the page they are on. ScribeFire has long been one of the most popular blogging extensions for Firefox, and it has made its way to Google Chrome. ScribeFire allows you to create, edit and update all your blogs from one extension. It has built-in support for WordPress, Blogger, TypePad, Windows Live Spaces, Tumblr, Posterous, Xanga, LiveJournal, and other blogging platforms. 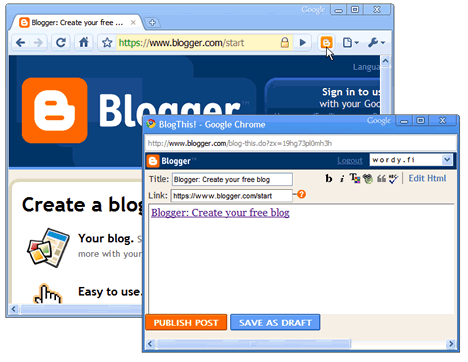 It’s quick, easy and probably the best extension for blogging on Chrome. 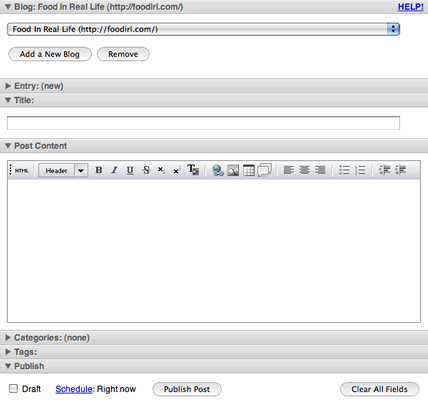 Blogger has their own extension called Blog This! It’s built by Google specifically for their Blogger platform so you know its gotta be good. 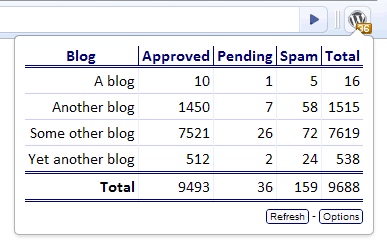 If you are still on Blogger, it is worth checking out. 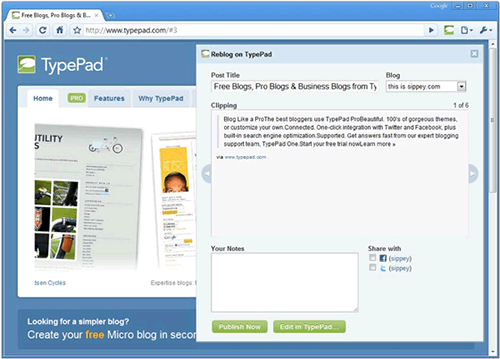 TypePad also has their own Chrome extension called TypePad Blog It. It only works for TypePad blogs and is an official TypePad extension so you know it’ll integrate well into their system. 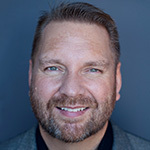 It’s worth checking out if you use TypePad. As for WordPress, there isn’t an official extension, but I’m not sure there needs to be. Between ScribeFire and WordPress’ Press This bookmarklet, the idea of having an extension doesn’t seem necessary. There is however two extensions that will notify WordPress users of new comments. One is called WordPress Comments Notifier and doesn’t do a lot yet, other than notifying you of new comments, but they say they are going to add functionality for managing comments. There is also WordPress Checker that will check one, or more, blogs and return the number of comments, comments in moderation, and spam comments. I think that browser extensions are nice in some cases, but I for one haven’t found anything that can match the features and functionality of logging into a blog’s admin and using the official tools. I do however think that extensions to help manage comments would be a nice addition to any browser. Have you found any other good ones?